The new Rose Square would feature a projection of a Lincoln Cathedral stained glass window. 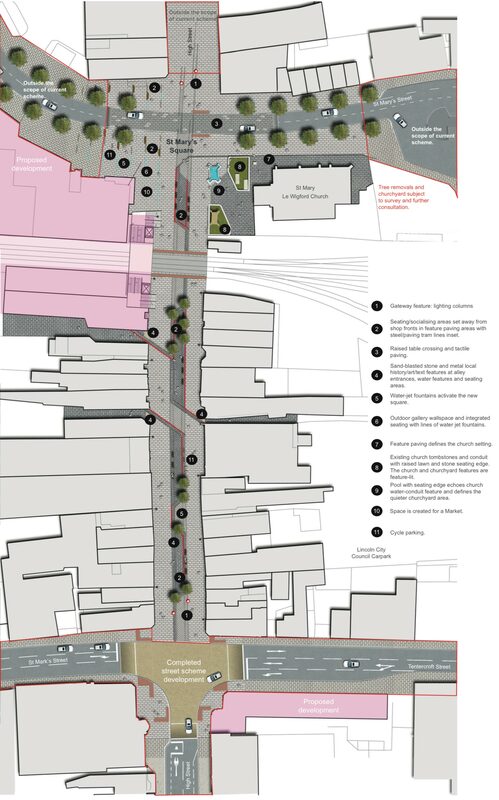 Lincolnshire County Council has put forward two new-look plans for a pedestrian zone on Lincoln High Street. The plans, which are currently being developed along with feedback from attendees of proposal display events, would see the section of the High Street between Tentercroft Street and St Mary’s Street closed off completely to vehicles. The pedestrian-only area would be redesigned with modern features and facilities and current options include unique lighting features, water fountains and highlights of local heritage. 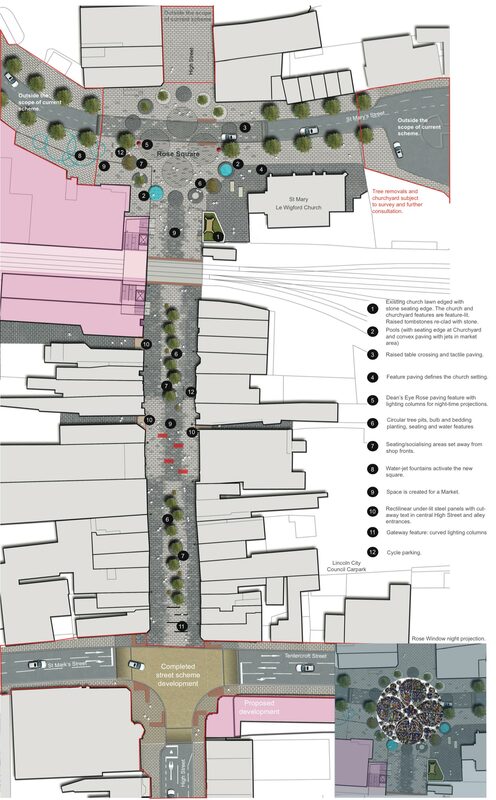 Examples in the county council’s plans for water jet features in the new pedestrian zone. A concept which draws on the design of Lincoln Cathedral’s stained glass Dean’s Eye Rose Window, with an image of the colourful glass projected on the paving of the new ‘Rose Square’. The square would also be defined with circular planting and water features. Local history and old tram lines inspired the ideas behind a second design for the area, which would in this example be named ‘St Mary’s Square’. Steel tracks would wind along the High Street and tree planters with wheels would be movable on the tracks. The design also features in-paving lighting and lines of water-jet fountains and a pool. Local history text or public art would be embedded in the streetscape. The second design idea would feature water jets and pools as well as tram-line inspired features. Development of the area will begin on completion of the East West Link road through the city in 2016. Members of the public were invited to review the proposals on February 3 and submit their ideas and feedback. In addition, work is underway to improve pedestrian access over the High Street level crossing with the erection of a new footbridge. Les Davies, senior projects leader, said: “Around 50 people came along over the day, including local businesses and members of the public. “The feedback was mostly supportive, although we do need to carefully consider how we cater for local businesses that rely on vehicles accessing the front of their property. “The opportunity to remove traffic from the area was well supported, as was the idea of introducing a street market and more pavement cafes. “We’re now analysing the feedback, and will then prepare a further option to take forward. “We hope to complete this phase of the consultation by the end of March.